The roundabout construction project was completed in December 7, 2018. LA CENTER — A new roundabout construction project in La Center was completed in December. Prior to construction of the roundabout, the intersection consisted of a stop-controlled access from 4th Street to Pacific Highway and created long queuing of vehicles on 4th Street during peak hours. This construction project was financed through a combination of the State Transportation Program Rural funds and State Transportation Improvement Board funding. The State Transportation Rural Funding was awarded by the Regional Transportation Council. Harper Houf Peterson Righellis designed the project for the city and the design was partially funded by State Transportation Program Rural funding. McDonald Excavating began construction in May 2018 and the project was completed in December 2018. The contractor constructed the project in two stages of detours, rather than the four stages proposed in the plans. 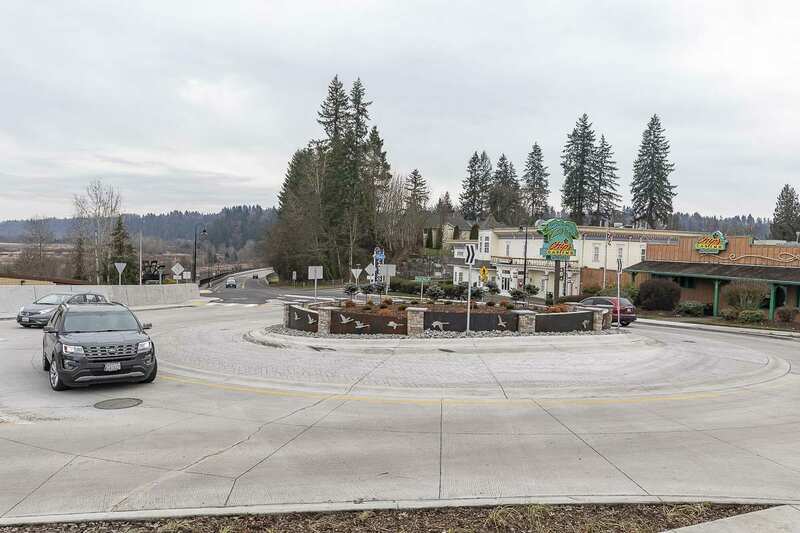 By constructing the roundabout in two stages, the overall project length was shortened, as well as reducing the time of utility relocations to accommodate the roundabout construction. The roundabout center island art feature consists of stainless steel swans bolted onto Corten steel plates attached to a concrete masonry wall. A concrete barrier along the east side of Pacific Highway also features stainless steel swans embedded in the concrete. The newly constructed roundabout serves over 12,000 vehicles per day and provides service to residents in La Center as well as in Clark County and provides a connection to Interstate 5. The Roundabout is the focal point of the entrance to La Center and will provide capacity for the future development in La Center. Information provided by the city of La Center.